This month we have 2 awesome fitness challenges. 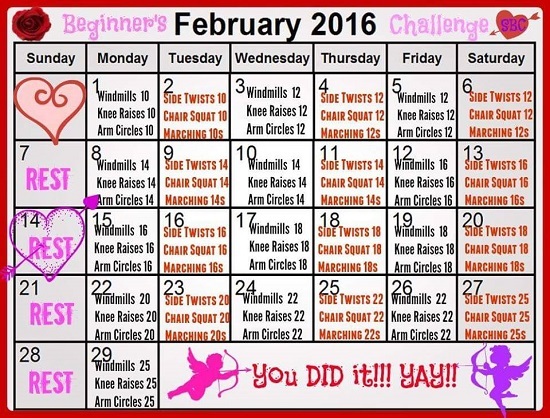 The first is a beginner's calendar with windmills, knee raises, arm circles and marching. The second one is a Beginner / Intermediate workout calendar with squats, lunges, crunches, leg lifts and push ups. You can actually do the 2nd intermediate calendar if at a beginners level or make it more advanced by doing each day's exercises two or three times; you can even even do both calendars together. 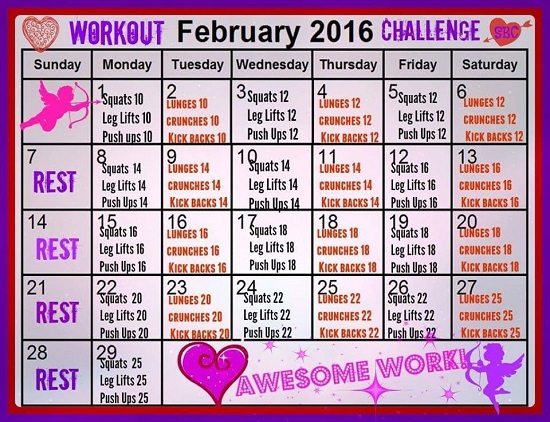 The sky's the limit ... Just use these February Fitness Calendars to keep moving this month!!! Please feel free to BOOKMARK this page or click one of the SHARE buttons below to SAVE these calendars to use throughout the week! Here are the exercise examples for the Beginner's Fitness Calendar. Just click the image to make it large enough to see more clearly and follow the instructions written to the side. Just as you see in the pictures: Stand up with arms out, bend at the waist to touch right arm to the left foot. Stand back up straight, bend at the waist and touch your left arm to your right foot. Start with hands touching and elbows out. Slowly turn left and back to the middle position; then turn right and back to the middle position. Just like you do a squat with arms out, but don't let your bottom actually sit on the chair. Sit on a chair, hand holding each side, lift your knees. Here is a video example. There is not am image shown for the arm circles, but they are the same ones we did in gym class as a kid: small arm circles, large arm circles, forwards and backwards. 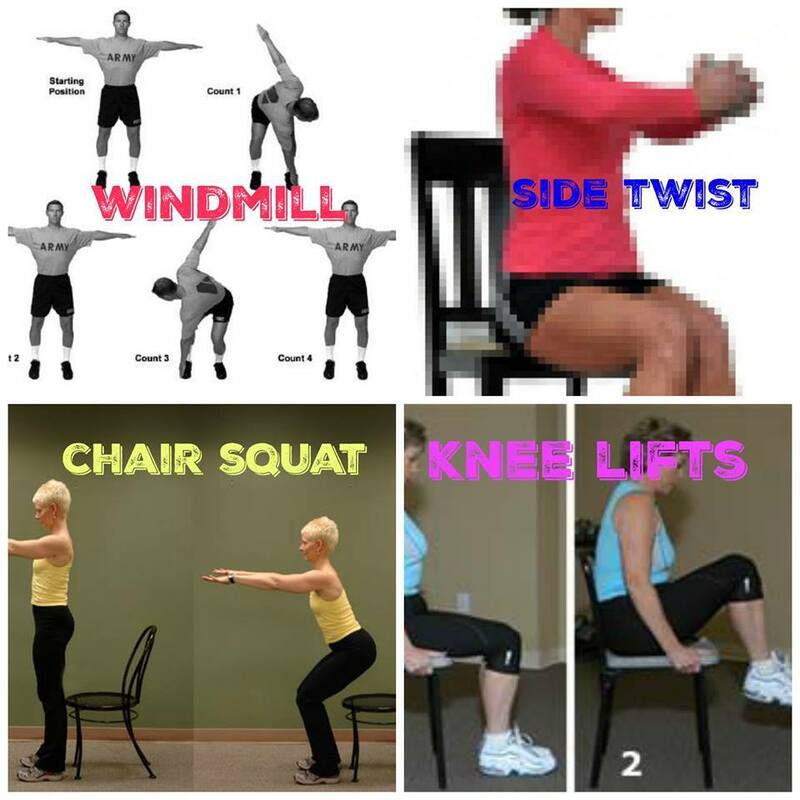 You can do these as comfortable for your shoulders and arms; just make sure to do them for the range of motion and flexibility. This second calendar has exercises that are familiar to most of us from past challenges. Please use this graphic chart for examples of how you should do these intermediate workouts. Click the image to make it larger and see the exact formats. Do them exactly as you see in the picture (arms folded), buttocks out, back straight at a slant. If it is too uncomfortable lifting your neck as shown in the picture, you can lay flat and lift legs straight up. Keep your arms and back in formation; on your knees and cross feet OR no knees and legs straight. Do your lunges as seen in the pictures. Quality over speed; take your time and do them right. Place a rolled towel under the small of your back for better comfort and form. Only go as high as you see in the picture. Make sure to choose a sturdy chair, hold and lean forward with a straight back, lift your legs straight as you see in the picture. Lift left leg and then right leg ---> That equals on set, so if the day says to do 12 that is 1 (left and right legs), 2 (left and right legs), 3 (left and right legs) and so on, so 24 total. Last month I posted the challenge daily, but I will post this February, I will post weekly and then do a check in the following week (on the 7th, 14th, 21st and March 1st), Please make sure to ADD ME as a friend on Facebook and send me a message to join the group to participate! How can I copy these to have posted in my workout room? Hi Patti, I am so sorry to have missed this comment when you posted it. For the future, when you see a calendar like this, just click on it and the image opens in a new window. Print it from there.